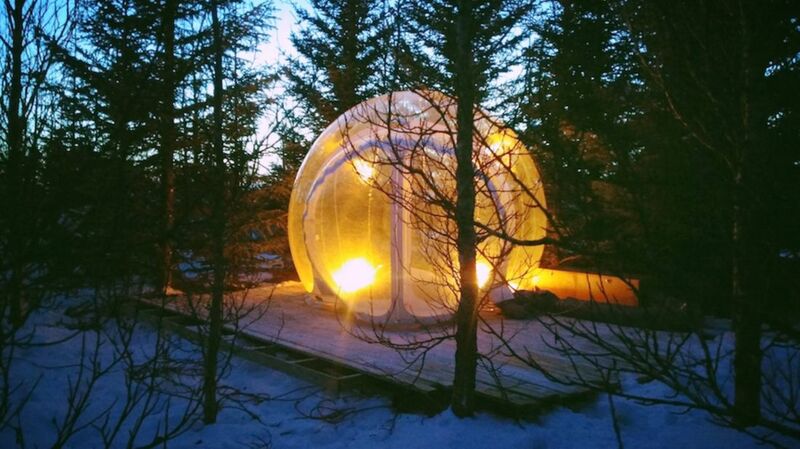 There’s camping, glamping, and now, in a forest just outside Iceland’s popular Golden Circle, there’s an unusual, inflatable mix of the two: bubble-ing. The new Aurora Bubble Hotel, a clear, inflatable plastic “bedroom,” is the brainchild of Iceland native and Northern Lights expert Robert Sveinn Robertsson. The concept started when Robertsson was advising a customer on his Northern Lights expedition. In passing, the customer suggested he create a clear-ceiling hotel for sleeping under the aurora borealis, and Robertsson quickly turned this recommendation into action. In January of this year, the initial “Bubble” was born. At first glance, the Aurora Bubble Hotel is a cross between a heated igloo and a bouncy house. The Bubble stays inflated with a noiseless ventilation system that continuously refreshes the air to prevent humidity and adjust the temperature based on thermostat settings. If punctured, the Bubble will slowly deflate, but it has a thin metal frame to support the walls until it’s repaired. Inside, there’s room for one full bed, one night lamp, two small suitcases, and … that’s about it. To provide guests with a sense of privacy—which is important, given its clear plastic walls—the Bubble is located on a remote farm near a town called Reykholt. Its exact location is only shared with Bubble Hotel guests; it’s not listed on the hotel's website. Because of the relatively tight quarters, there’s no bathroom inside the actual Bubble. Instead, when nature calls, guests use an outhouse with an upscale portable toilet several feet away. Bathing-wise, guests shower at the nearby Secret Lagoon, a remote geyser-powered hot spring that gives the country's more famous Blue Lagoon a run for its money. Off-site showers. Outhouse in the woods. Secret locations. That’s a lot of work just to sleep in a plastic bubble, isn’t it? Actually, no. These few small inconveniences aren’t deterring travelers who are willing to put in a little extra effort to sleep with a stunning view. The Aurora Bubble Hotel is booked almost entirely through May (at roughly $225 a night), and Robertsson has seen such great demand, he’s opening two more Bubbles this July. The new units will be larger, with room for a table and two chairs. Robertsson is also building an on-site shower. This month, my boyfriend and I were among the Bubble Hotel’s first guests during a stop on our road trip through Iceland. Even with a little skepticism, the inside was much cozier than we anticipated, which made for a perfect night of stargazing and, for a brief two minutes, watching the Northern Lights. As you’d imagine, sleeping in a clear, inflatable Bubble is a little unsettling. At any moment you could wake up to a person or animal (or heck, even an elf—this is Iceland after all!) staring at you through the thin plastic walls. But fortunately, Robertsson's secrecy and covert directions made sure that wasn't the case. The only visitors we had were up-and-at-’em birds that awakened us from a surprisingly restful sleep. Whether it’s Aurora chasing in the winter or stargazing in the summer, the Bubble Hotel is an unusual, year-round option for those looking for an off-the-beaten-path adventure. And even if the stars don't cooperate, you’ll have quite the Icelandic tale to tell.